The uterine endometrium coordinates a wide spectrum of physiologic and immunologic functions, including endometrial receptivity and implantation as well as defense against sexually transmitted pathogens. Macrophages and epithelial cells cooperatively mediate innate host defense against bacterial invasion through the generation of immunologic effectors, including cytokines and antimicrobial peptides. In this study, we demonstrate that stimulation of peripheral blood monocytes and uterine macrophages with bacterial LPS induces the production of biologically active proinflammatory IL-1β. High doses of estradiol enhance LPS-induced IL-1β expression in an estrogen receptor-dependent manner. Furthermore, both peripheral blood monocyte- and uterine macrophage-derived IL-1β induce secretion of antimicrobial human β-defensin 2 by uterine epithelial cells. These data indicate dynamic immunologic interaction between uterine macrophages and epithelial cells and implicate a role for estradiol in the modulation of the immune response. The human uterine endometrium is charged with the unique task of maintaining an environment hospitable to implantation and pregnancy, while simultaneously conferring protection against pathogenic challenge. In this regard, uterine macrophages and epithelial cells are key allies in mobilizing innate immune defenses within the endometrium; both cell types recognize invading microorganisms and their products, and elaborate a variety of chemokines, cytokines, and antimicrobial peptides to combat these challenges (as reviewed in Refs. 1 , 2). Circulating monocytes mediate recognition and phagocytosis of pathogens and cellular debris, and migrate into tissues, where they differentiate into macrophages. As professional phagocytes, macrophages play a pivotal role in the initiation, maintenance, and resolution of inflammatory responses. These functions are mediated, in part, through the production of a diverse range of innate effectors including proinflammatory IL-1β, which is rapidly induced by exposure of macrophages to endotoxin (3, 4). However, despite the rapid induction of IL-1β message and propeptide, monocyte-derived macrophages as well as intestinal and alveolar macrophages are deficient in their ability to release mature, active IL-1β in response to LPS stimulation (5, 6, 7). IL-1β is synthesized as a 31-kDa biologically inactive propeptide, which is cleaved by the IL-1β-converting enzyme (ICE3; caspase-1) to release an active 17-kDa peptide (4). ICE is an intracellular cysteine protease that is activated by bacterial components including LPS (8). Inefficient processing of precursor IL-1β is due to lack of caspase-1 activity (9, 10). The addition of exogenous ATP to these macrophages restores ICE activity, and biologically mature IL-1β is generated (11). In the context of the uterus, it is unknown whether human uterine macrophages can produce biologically active IL-1β. This is an important question, because IL-1β has been implicated in the regulation of tissue remodeling, endometrial receptivity, and decidualization (12, 13, 14). IL-1β immunoreactivity has been detected in the endometrial stroma, as well as in lymphoid aggregates in the stratum basalis, and maximal expression is observed during the mid to late secretory phase of the menstrual cycle (15, 16, 17, 18). It is unknown what proportion of this immunoreactivity is due to biologically active IL-1β. IL-1β binds two receptors: the IL-1 receptor type I (IL-1RI), which is required for signal transduction, and the decoy receptor IL-1R type II, which lacks signaling capabilities (19, 20, 21). IL-1RI expression has been localized to the uterine surface epithelium, and the kinetics of its expression mirror those of IL-1β, in that peak levels are present during the mid to late secretory menstrual phase (15). Recent data suggest that binding of IL-1β to its receptor induces molecular changes in the expression patterns of adhesion molecules and antiadhesion molecules, which are essential for blastocyst attachment (22). Moreover, release of proinflammatory IL-1β rapidly induces local and systemic responses to pathogen invasion, because IL-1β stimulates transcription and enhances the mRNA stability of other proinflammatory mediators, such as IL-8 and TNF-α (23, 24, 25). Thus, IL-1β modulates a wide range of biological activities within the human female reproductive tract (FRT), both facilitating embryonic implantation, as well as conferring protection from pathogenic challenge. Recent work from our group has demonstrated that activation of uterine epithelial cells with rIL-1β induces expression of the antimicrobial peptide human β-defensin 2 (HBD2) (26). Epithelial cells form a first line of defense in the FRT and are in close contact with macrophages. These cells cooperatively mediate innate host defense against bacterial invasion through the generation of a broad variety of immunologic effectors, including cytokines, chemokines, and antimicrobial molecules (1, 2). Among antimicrobial agents, β-defensins constitute a unique link between innate and acquired immunity (27). In addition to microbicidal functions, HBD2 induces chemotaxis of immature dendritic cells and memory T cells (28). Therefore, HBD2 expression within the uterine endometrium provides an important means of combating pathogenesis and mobilizing immune defenses. Although primary human uterine epithelial cells express the endotoxin receptor TLR4 as well as TLR2, they do not secrete IL-1β or other proinflammatory cytokines when stimulated with LPS and/or TLR2 ligands such as S-[2,3-Bis(palmitoyloxy)-(2-RS)-propyl]-N-palmitoyl-(R)-Cys-(S)-Ser-Lys4-OH, trihydrochloride (Pam3Cys), peptidoglycan (PGN), or zymosan (29). In contrast, macrophages are exquisitely sensitive to bacterial stimulation and produce copious IL-1β upon activation with LPS (30). Because we previously determined that IL-1β induces HBD2 expression in uterine epithelial cells, we postulated that the response to bacterial stimulation within the human FRT is mediated cooperatively by dynamic interaction between epithelial cells and macrophages. A paucity of data is available regarding the mechanisms by which epithelial cells and macrophages communicate within the human endometrium to counter bacterial challenge. To address this question, we stimulated peripheral blood monocytes and uterine macrophages with LPS and quantified release of IL-1β by these cells. Supernatants derived from LPS-stimulated monocytes and macrophages were cocultured with uterine epithelial cells, and HBD2 expression was analyzed in these cells. Finally, we examined the effect of estradiol on LPS-induced mRNA expression and secretion of IL-1β. Human tissues were obtained immediately following surgery from patients from whom informed consent was obtained. Donors ranged in age from 33 to 62 years and were treated for a diversity of gynecologic maladies. All tissues used in these studies were distal to sites of pathology and were determined to be unaffected with disease at the gross anatomical level. Approval to use human tissues was obtained from the Dartmouth Institutional Review Board in accordance with the human experimentation guidelines of the U.S. Department of Health and Human Services. PBMC were isolated from heparinized whole blood with Ficoll-Hypaque (density = 1.077). Monocytes were purified from mononuclear cell fractions as described by Mentzer et al. (31). Positive selection was used for purification of macrophages from human endometrial tissues. Tissues were minced, digested with an enzyme mixture consisting of pancreatin, hyaluronidase, and collagenase, and filtered through a 100-μm mesh screen to facilitate cell dispersion (32). Contaminating RBCs were eliminated from endometrial cells by lysis with NH4Cl/Tris-HCl for 5–10 min at room temperature. Blood cell contamination of these endometrial tissue cells was <2% (32). Following overnight culture in complete RPMI 1640, cells were centrifuged at 1500 rpm for 10 min. Cell pellets were then incubated with anti-CD14+ MicroBeads (Miltenyi Biotec) for 15 min at 4°C. Cell suspensions were applied to LS columns (Miltenyi Biotec) and processed in magnetic fields in accordance with the manufacturer’s instructions. Retained uterine macrophages were eluted from columns, washed, and incubated in complete RPMI 1640 for stimulation with LPS. Purity of macrophages was estimated at 95% as assessed by flow cytometry. Human uterine epithelial ECC-1 cells (originally established by Dr. P. Satyaswaroop and provided by Dr. G. Olt, Penn State College of Medicine, Milton S. Hershey Medical Center, Hershey, PA) were cultured in Falcon cell culture inserts in 24-well culture dishes designed for these cell inserts (Fisher Scientific). Cells were maintained in phenol red-free DMEM-F12 complete medium (Mediatech) (DMEM-F12 supplemented with 10% heat-inactivated defined FCS, 20 mM HEPES, 50 U/ml penicillin, 50 mg/ml streptomycin, and 2 mM l-glutamine). Apical and basolateral compartments contained 300 and 850 μl of complete medium, respectively. The human monocytic leukemia cell line THP-1 was obtained from the American Tissue Type Collection. Cells were cultured in HEPES-buffered RPMI 1640 (Mediatech) containing 10% heat-inactivated FCS (HyClone) and 50 μg/ml gentamicin sulfate (Sigma-Aldrich). To induce differentiation, THP-1 cells were treated for 48 h with 50 ng/ml PMA. At the conclusion of this treatment, plastic-adherent cells were washed twice with 1× PBS (Sigma-Aldrich), fresh medium was added, and cells were stimulated with 10 ng/ml LPS to induce ICE expression. Human monocytes and macrophages were maintained in HEPES-buffered RPMI 1640 (Mediatech) supplemented with 10% FCS (HyClone) and 50 μg/ml gentamicin sulfate (Sigma-Aldrich) at a density of 1 × 106 cells/ml. For coculture experiments, ECC-1 cells were grown to high transepithelial resistance on Transwell inserts and then incubated with supernatants derived from LPS-stimulated or unstimulated uterine macrophages or peripheral blood monocytes for 24 h. Blocking experiments were conducted by preincubating myeloid cell supernatants with 500 ng/ml neutralizing anti-IL-1β Ab (clone no. 8516.311) (Abcam) for 1 h before addition to ECC-1 cells. Apical and basolateral supernatants were collected for analysis of HBD-2 expression. To screen for IL-1β production, human peripheral blood monocytes were treated for 24 h with the following TLR agonists: 10 ng/ml LPS (Sigma-Aldrich), 10 ng/ml Pam3Cys (EMC Microcollections), 20 μg/ml Staphyloccous aureus PGN (InvivoGen), 1 μg/ml poly(I:C) (InvivoGen), and 10 μg/ml Salmonella typhimurium flagellin (InvivoGen). LPS, Pam3Cys, poly(I:C), and flagellin were reconstituted in LPS-free dH2O; PGN was prepared in ethanol. Hormone treatment was performed in phenol red-free RPMI 1640 (Mediatech) supplemented with 10% charcoal dextran-stripped FCS (HyClone). Monocytes were preincubated with 17-β estradiol (Calbiochem) as indicated for 24 h and then treated with or without 10 ng/ml Escherichia coli LPS (Sigma-Aldrich) for an additional 12 h. For experiments in which estrogen receptor (ER) binding was inhibited, monocytes were preincubated with 1 μM ICI 182,780 for 1 h before treatment with estradiol and LPS. At the conclusion of these incubations, total RNA was extracted from these cells, and supernatants were harvested for analysis of IL-1β production by ELISA. Total RNA was extracted from human peripheral blood monocytes and endometrial macrophages using RNeasy mini columns (Qiagen). To preclude genomic DNA contamination, all RNA samples were treated with RNase-free DNase I before amplification. RNA integrity and concentration were determined with the RNA6000 Nano LabChip kit (Agilent). Using 500 ng of RNA as template, first-strand cDNA was synthesized using random hexamers and SuperScript II Moloney murine leukemia virus reverse transcriptase (Invitrogen Life Technologies). TaqMan PCR was performed to quantify IL-1β mRNA expression. A total of 0.5 μl per well of cDNA was transferred into 96-well format plates, and TaqMan Master Mix (Applied Biosystems) was added as advised by the manufacturer. TaqMan-validated primers and IL-1β TaqMan MGB probe (labeled with fluorescent reporter dye 6FAM) were used for amplification of IL-1β. Input cDNA was normalized with a validated predeveloped assay reagent β-actin primer probe pair (Applied Biosystems) as an internal control. Amplification was performed using an Applied Biosystems 7300 real-time PCR system with an optical unit that permits real-time monitoring of increased PCR product concentration. Threshold cycle number was determined with Opticon software, and IL-1β mRNA expression levels were normalized to β-actin levels with the formula 2-(Et-Rt), where Rt is the mean threshold cycle for the reference gene (β-actin), and Et is the mean threshold cycle for the experimental gene. Relative fluorescence units were assigned to these values, and these data were used to generate the expression profiles delineated in the text. The thermal profile for TaqMan PCR consisted of 2 min at 50°C and 10 min at 95°C, followed by 40 cycles of 95°C for 15 s and 60°C for 1 min. Amplicon accumulation was measured during the extension phase. All reactions were performed in duplicate. Data were analyzed using ABI 7300 quantification software (Applied Biosystems). Supernatants were collected from cultured monocytes and macrophages, and expression of human IL-1β was quantified using the human IL-1β/IL-1F-2 Quantikine ELISA kit (R&D Systems), which predominantly recognizes the mature, biologically active form of IL-1β. Analysis of HBD2 expression was performed by ELISA (PeproTech), which had a detection limit of 2.3 pg/well. Caspase-1 (ICE) activation in human endometrial macrophage supernatants was analyzed with the human caspase-1/ICE Quantikine ELISA kit (R&D Systems). Monocytes and macrophages were stimulated with 10 ng/ml LPS for 24 h, and whole cell lysates were prepared using the M-PER lysis reagent (Pierce). Protein content was quantified using the BCA protein assay (Pierce). Proteins were resolved by 15% SDS-PAGE and electrotransferred to nitrocellulose membrane in Tris-glycine buffer with 20% methanol. Immunoblots were washed in 1× Tris-buffered saline-0.05% Tween 20 and blocked in 5% milk for 1 h at room temperature. Membranes were probed with a rabbit polyclonal anti-IL-1β Ab (Cell Signaling Technologies) followed by a goat anti-rabbit HRP-conjugated secondary Ab (Bio-Rad). The primary anti-IL-1β Ab detects endogenous levels of both the 31-kDa precursor and 17-kDa mature form of IL-1β. Reactive Ags were visualized with SuperSignal chemiluminescence substrate (Pierce). Data are represented as mean ± SD. As indicated, statistical analysis was performed with a paired t test, and statistical significance was achieved at p < 0.05. Previous studies have demonstrated that stimulation of human monocytic cell lines with LPS induces expression of proinflammatory IL-1β, and that this cytokine subsequently induces expression of antimicrobial defensin peptides from epithelial cells (33, 34). However, because there is a deficiency in the conversion of pro-IL-1β to biologically active IL-1β in other macrophages derived from mucosal sites (5, 7), it was important to determine whether uterine macrophages produce active IL-1β. Given the fundamental role that TLRs play in mediating innate immune function and the broad scope of microbial challenges encountered by the human FRT, initial studies evaluated the ability of TLR agonists to up-regulate IL-1β production in primary human monocytes and endometrial macrophages. As demonstrated in Fig. 1⇓A, stimulation of primary human peripheral blood monocytes with LPS induces production of IL-1β mRNA. This is also reflected in expression of active IL-1β, as analyzed by ELISA (Fig. 1⇓B), which detects mature IL-1β and cross-reacts with a minor fraction of pro-IL-1β (∼20% on a molar basis). LPS induces IL-1β production in human peripheral blood monocytes. Mononuclear cells were separated from peripheral blood by Ficoll-Hypaque, washed extensively, and monocytes were isolated by positive selection using CD14+ magnetic beads. CD14+ monocytes were incubated with TLR agonists for 24 h (10 ng/ml LPS, 10 ng/ml Pam3Cys, 20 μg/ml PGN, 10 μg/ml flagellin, and 1 μg/ml poly(I:C)). A, IL-1β mRNA expression was analyzed by TaqMan PCR. B, Supernatants were harvested from these cultures, and IL-1β protein production was assessed by ELISA. Similarly, IL-1β production is up-regulated by treatment of positively selected CD14+ human uterine macrophages with 10 ng/ml LPS (Fig. 2⇓). 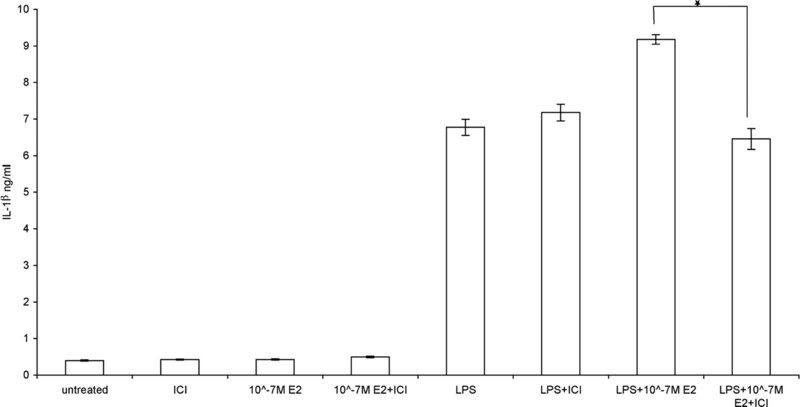 Although most assays were performed with LPS (Sigma-Aldrich) that potentially contained TLR2 and TLR4 agonists, experiments using ultrapure phenol-water extracted LPS confirmed the production of IL-1β (data not shown). Notably, other TLR agonists (including the TLR2 agonists Pam3Cys and PGN) failed to induce IL-1β expression in either peripheral blood monocytes or uterine macrophages. These observations are consistent with reports by Jones et al. (35) in which stimulation of RAW264.7 macrophages with LPS, but not with the TLR2 agonist mycobacterial cell wall glycolipid lipoarabinomannan, elicited IL-1β production. LPS induces IL-1β production in human uterine macrophages. Human endometrial tissue was sectioned and enzymatically digested. Macrophages were isolated by positive selection using CD14+ magnetic beads and incubated with 10 ng/ml LPS for 24 h. Supernatants were collected from these cultures, and IL-1β secretion was analyzed by ELISA. Secretion of biologically active IL-1β is tightly regulated by caspase-1 (ICE), which cleaves the 31-kDa precursor pro-IL-1β to a mature, 17-kDa active peptide (4). Therefore, modulation of ICE expression provides a potential means for regulating the release of functional IL-1β. Because LPS has been shown to induce activation of ICE in THP-1 cells and monocytes (8), ICE expression was also analyzed in LPS-stimulated uterine macrophage supernatants. 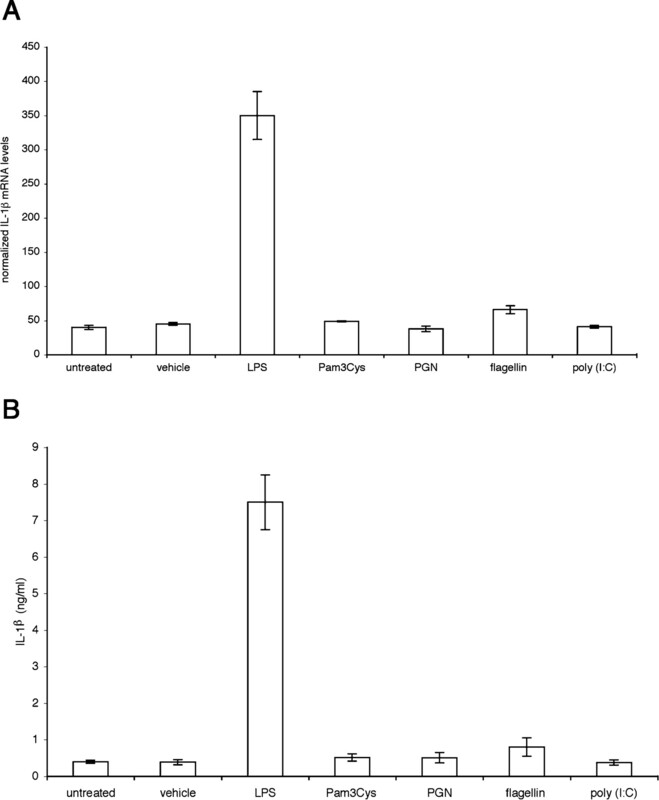 In accordance with previous reports, treatment of differentiated THP-1 cell cultures and peripheral blood monocytes with LPS induces ICE activity (Fig. 3⇓A). Similarly, incubation of uterine macrophages with 10 ng/ml LPS markedly enhances levels of ICE in these cells (Fig. 3⇓A). These data indicate that, in a manner analogous to blood monocytes, FRT-derived macrophages secrete active ICE in response to pathogenic challenge, thus providing a mechanism for increased release of proinflammatory bioactive IL-1β. Caspase-1 (ICE) is active in human uterine macrophages. A, THP-1 cells were differentiated and incubated in the presence or absence of 10 ng/ml LPS for 12 h. Peripheral blood monocytes and uterine macrophages were similarly untreated or activated with 10 ng/ml LPS for 12 h. Active ICE was measured in cell supernatants with Quantikine human caspase-1/ICE ELISA. B, Pro-IL-1β is cleaved in uterine macrophages. CD14+ tissue macrophages were isolated from human endometrium and incubated in the presence or absence of 10 ng/ml LPS for 24 h. Whole cell lysates were prepared from these cells, and 50 μg of each lysate was run on 15% SDS-PAGE and subjected to immunoblot analysis with an Ab that detects both immature (31 kDa) as well as active cleaved IL-1β (17 kDa). To ensure that cleavage of pro-IL-1β occurred in uterine macrophages, immunoblot analysis was performed on lysates derived from LPS-stimulated macrophages using an Ab that detects both the pro and mature forms of IL-1β. As demonstrated in Fig. 3⇑B, both forms are present in LPS-activated uterine macrophages. Therefore, LPS induces both synthesis of the IL-1β precursor protein and activation of ICE in uterine macrophages, leading to enhanced cleavage of the precursor and generation of biologically active IL-β. 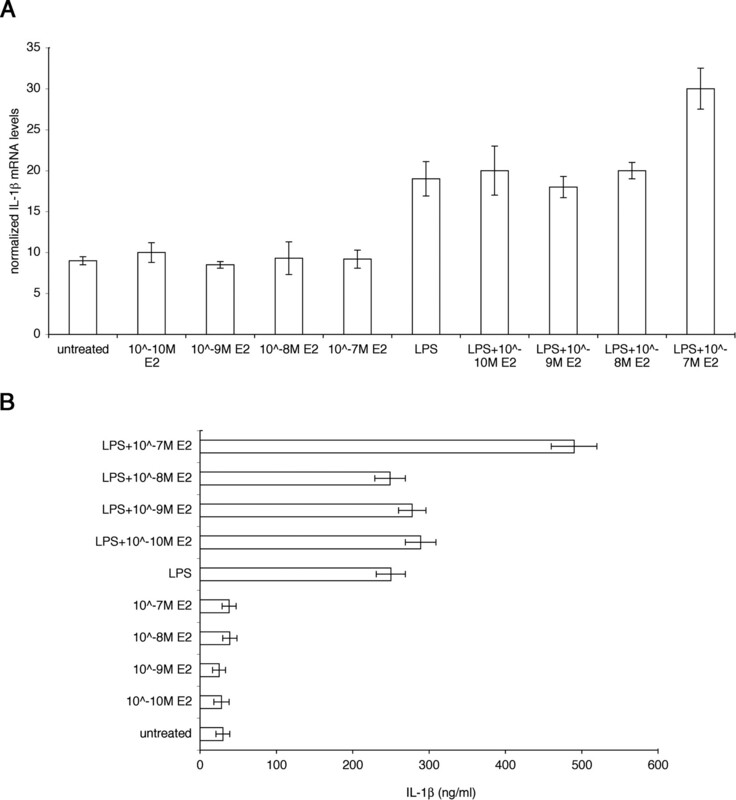 Ligation of TLRs has been reported to induce expression of antimicrobial defensins in human pulmonary, intestinal, and vaginal epithelial cells (36, 37, 38). Recent work suggests that defensins play a central role in mediating innate immune responses to bacterial and viral challenge in tissues of the female genital tract (2, 39, 40, 41). However, Schaefer et al. 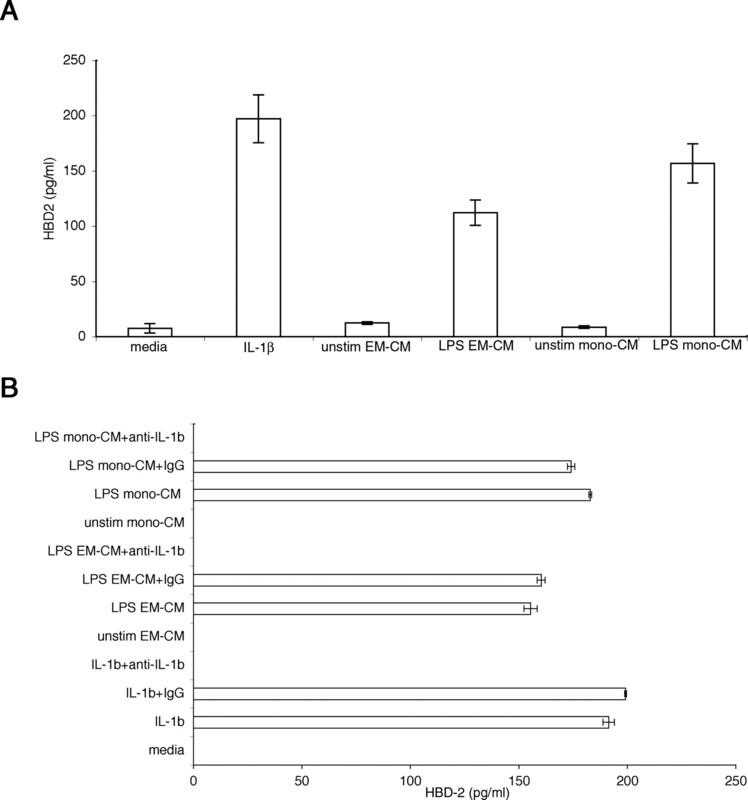 (29) have demonstrated that whereas HBD2 levels are elevated in uterine epithelial cells in response to treatment with the TLR3 agonist poly(I:C), HBD2 is not expressed when these cells are stimulated with ultrapure LPS and preparations of LPS that are contaminated with TLR2 ligands (T. M. Schaefer, unpublished observations). Intriguingly, this group has also shown that stimulation of human uterine epithelial cells with exogenous IL-1β induces expression of HBD2 (29). Notably, HBD-2 is not expressed by either human peripheral blood monocytes or uterine macrophages (data not shown). Given these data and the responsiveness of uterine macrophages to LPS, we reasoned that in the context of bacterial challenge, uterine macrophages would elaborate proinflammatory IL-1β and thus stimulate uterine epithelial cell production of HBD2. To test this hypothesis, supernatants from LPS-activated uterine macrophages were cocultured with polarized human ECC-1 uterine epithelial cells. As demonstrated in Fig. 4⇓A, HBD2 levels are markedly induced in epithelial cells that have been cultured with LPS-stimulated uterine macrophages. Similarly, supernatants derived from LPS-activated peripheral blood monocytes also up-regulated HBD2 production (Fig. 4⇓A). In both instances, HBD2 was released from the basolateral surfaces of the polarized epithelial cells. In contrast, supernatants derived from unstimulated monocytes and macrophages failed to elicit defensin production from ECC-1 cells (Fig. 4⇓, A and B). Human monocyte and uterine macrophage-derived IL-1β induces HBD2 production in human uterine epithelial cells. A, Peripheral blood monocytes (mono) and positively selected endometrial tissue macrophages (EM) were incubated with 10 ng/ml LPS for 24 h. Supernatants were harvested from these cultures (conditioned media; CM) and cocultured with polarized uterine epithelial cells both apically and basolaterally for 24 h. Epithelial cell supernatants were collected and analyzed for HBD2 production by ELISA. B, Anti-IL-1β-neutralizing mAb completely inhibits uterine epithelial cell HBD2 induction. LPS-stimulated myeloid cell supernatants (CM, containing 5 ng/ml IL-1β) were preincubated with 500 ng/ml neutralizing α-IL-1β Ab for 1 h before addition to epithelial cells. Supernatants were harvested both apically and basolaterally and analyzed for HBD2 production by ELISA. To ensure the specificity of the contribution of monocyte and macrophage-derived IL-1β to HBD2 induction in uterine epithelial cells, we assessed the effect of neutralizing α-IL-1β mAb in this culture system. Significantly, the addition of neutralizing α-IL-1β mAb completely suppressed HBD2 production by ECC-1 cells (Fig. 4⇑B). Incubation of control IgG with monocyte and uterine macrophage-derived LPS-stimulated supernatants did not affect HBD2 induction in uterine epithelial cells. These results suggest that among monocyte and uterine macrophage-derived cytokines, IL-1β is likely a principal modulator of HBD2 production in uterine epithelial cells. Estrogen has been shown to exert diverse effects on inflammatory mediator production by a broad range of myeloid effector cells, including microglia and osteoclasts (42, 43). Moreover, studies conducted by DeLoia et al. (44) have suggested that circulating estrogen selectively regulates the recruitment of macrophages to the uterine endometrium. Because both monocytes and uterine macrophages express ERs (P. A. Pioli, unpublished observations and Ref. 45), we investigated the effect of estrogen on the ability of monocytes to modulate IL-1β expression in response to LPS treatment. Peripheral blood-derived monocytes were preincubated with various concentrations of estradiol (as indicated in Fig. 5⇓, A and B) for 24 h and then challenged with LPS for an additional 12 h. As demonstrated in Fig. 5⇓A, constitutive expression of IL-1β mRNA was not affected by pretreatment with estradiol. Similarly, low doses of estradiol had little effect on the ability of monocytes to induce IL-1β mRNA expression. 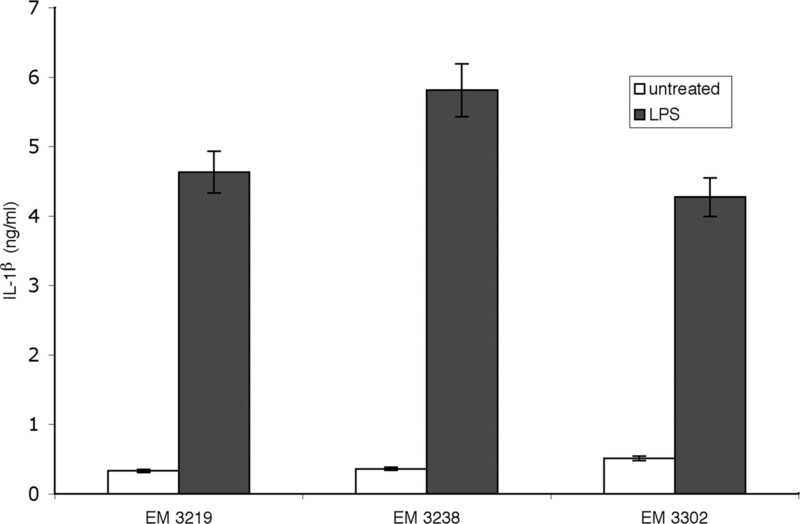 In contrast, preincubation of monocytes with 100 nM estradiol resulted in enhanced IL-1β mRNA and protein production in response to LPS stimulation (Fig. 5⇓, A and B). Estradiol augments LPS-induced IL-β levels in monocytes. Peripheral blood monocytes were incubated with indicated concentrations of 17-β estradiol for 24 h and then stimulated with 10 ng/ml LPS for an additional 12 h. A, Total mRNA was extracted from cells, cDNA was synthesized using random hexamers, and IL-1β mRNA expression was analyzed by TaqMan PCR. B, Estradiol augments LPS-induced IL-1β protein production in monocytes. Monocytes were treated as described above, and supernatants were collected from these cultures. IL-1β production was quantified by ELISA. To determine whether the effect of estradiol on LPS-induced IL-1β production was mediated through ER, monocytes were preincubated with estradiol (100 nM) and/or the ER antagonist ICI 182,780 (1 μM) and subsequently stimulated with LPS. Although addition of the ER antagonist did not affect constitutive expression of IL-1β, pretreatment of monocytes with ICI 182,780 markedly inhibited LPS-induced IL-1β expression (Fig. 6⇓). These data indicate that estradiol directly augments IL-1β production through engagement of ERs on human peripheral blood monocytes. Estradiol-enhanced IL-1β production is mediated through the ER. Peripheral blood monocytes were preincubated as indicated with 1 μM of the ER antagonist ICI 182,780 for 1 h before treatment with 100 nM estradiol for 24 h. Monocytes were then activated as indicated with 10 ng/ml LPS for an additional 12 h. Supernatants were harvested from cell cultures, and IL-1β production was analyzed by ELISA. Data are represented as mean ± SD for three replicates. p < 0.05 between LPS+E2 and LPS+E2+ICI. The innate immune defenses of the human endometrium play a critical role in curtailing pathogenic challenge, while simultaneously maintaining an environment hospitable to fertilization, fetal implantation, and successful pregnancy. Protection against uterine infection is crucial to ensuring reproductive success, because microbial infection is a major cause of preterm birth, as well as infertility and ectopic pregnancy (46, 47). Human β-defensins constitute an important component of innate defenses within the human endometrium. Recent work suggests that endometrial expression of HBD2 combats ascending infections that compromise early pregnancy (48). In this study, we demonstrate that peripheral blood monocytes and primary uterine macrophages respond to LPS stimulation by inducing expression of biologically active proinflammatory IL-1β, and that monocyte and macrophage-derived IL-1β elicits HBD2 production in uterine epithelial cells. Furthermore, pretreatment of monocytes with estradiol enhances LPS-induced IL-1β production, and this effect is mediated through nuclear ERs. These data implicate a role for estrogen in the modulation of the inflammatory response and provide a mechanism for cooperative interaction between uterine macrophages and epithelial cells in conferring protection against pathogenic challenge within the human FRT. It is notable that uterine epithelial cells fail to produce HBD2 in response to LPS activation, despite their expression of TLR4 (29). These observations are consistent with reports that epithelial cells derived from other mucosal sites, such as the lung, are hyporesponsive to endotoxin treatment (33). Tsutsumi-Ishii and Nagaoka (33) have demonstrated that HBD2 expression in A549 pulmonary epithelial cells is not induced by stimulation with even high doses of LPS (up to 100 μg/ml), but rather is transcriptionally up-regulated by mononuclear phagocyte-derived proinflammatory cytokine production. These authors examined supernatants derived from Mono-Mac 6 monocytic cells that had been stimulated with LPS and cocultured with A549 lung epithelial cells that were transfected with a HBD2 promoter luciferase reporter construct. Ab neutralization studies identified IL-1β as the major monocyte-derived activator of HBD2 transcription in pulmonary epithelial cells, because treatment of LPS-stimulated monocyte-derived supernatants with anti-IL-1β-blocking Ab reduced HBD2 promoter activity by 75–90% (33). In contrast, TNF-α played a relatively minor role in the induction of HBD-2 expression in the reporter cells (33). Given these results, we likewise examined the possible contributions of these cytokines to the increased HBD2 production we observed in uterine epithelial cells in response to coculture with LPS-stimulated peripheral blood monocyte and uterine macrophage supernatants. Results of our work indicated that IL-1β is entirely responsible for modulating uterine epithelial expression of HBD2, because the addition of neutralizing α-IL-1β mAb completely abrogated the induction of HBD2 expression. Consistent with previous studies conducted with human and murine monocytic and macrophage cell lines (reviewed in Ref. 49), we have shown that LPS induces production of IL-1β mRNA in peripheral blood monocytes and primary uterine macrophages. However, experiments performed with intestinal and pulmonary macrophages indicated that although LPS could stimulate IL-1β transcription, mature IL-1β was not actively secreted from these cells (5, 7). Failure to produce bioactive IL-1β in these cells was attributable to lack of active caspase-1, which cleaves immature pro-IL-1β to an active peptide (9, 10). In contrast, we observed release of mature IL-1β from LPS-treated uterine macrophages; this was confirmed by both immunoblot analysis as well as by ELISA. Furthermore, we also demonstrated that caspase-1 is functional in these cells, thus providing a mechanism for IL-1β cleavage. There is considerable functional and phenotypic heterogeneity among macrophage subsets (50, 51), and thus it is not surprising that macrophages derived from different mucosal sites display distinct characteristics. Indeed, such phenotypic distinctions may reflect the unique function of each macrophage within its individual cellular milieu. In this regard, the uterine endometrium is predominantly exposed to two Gram-negative pathogens, Neisseria gonorrhea and Chlamydia trachomatis (52). Given the unique function of this mucosal site (i.e., the maintenance of fetal implantation and development), it is advantageous to mount a rapid proinflammatory response to bacterial invasion. In the context of the gut, however, initiating inflammatory responses following exposure to LPS would likely have chronic deleterious consequences. Considered in this context, it is intriguing that studies conducted by Harder et al. (53) have demonstrated that epithelial-derived HBD2 preferentially kills Gram-negative bacteria. In this study, we show that treatment of uterine macrophages with LPS, the major surface component of Gram-negative bacteria, increases expression of proinflammatory IL-1β, which subsequently induces uterine epithelial cell production of HBD2. These data suggest a mechanism whereby uterine epithelial cells may combat pathogenic challenge through cooperative interaction with monocytes and uterine macrophages. Thus, although uterine epithelial cells do not produce HBD2 directly when stimulated with LPS, production of uterine epithelial HBD2 is invoked by macrophage-derived IL-1β, thereby conferring protection to the human FRT against Gram-negative bacterial invasion. Moreover, it is noteworthy that LPS-induced IL-1β expression is augmented only in the context of high concentrations of estradiol. Intriguingly, the dose of estradiol that mediated this effect (100 nM) has physiologic relevance during pregnancy (54, 55). These data suggest that during periods of regular menstrual cycling, estradiol has little influence on the ability of monocytes and macrophages to mediate proinflammatory cytokine production. However, during pregnancy, when estradiol levels are elevated and fetal protection is paramount, myeloid effector function is heightened, and consequently microbicidal release by epithelial cells is increased. The molecular mechanism by which estradiol mediates up-regulated IL-1β expression is likely transcriptional, because we have shown that IL-1β mRNA levels are increased in peripheral blood monocytes. In accordance with this observation, studies conducted with transfected RAW264.7 macrophages have demonstrated that estradiol enhancement of LPS-induced IL-1β promoter activity is mediated directly through the ER (56). Moreover, the IL-1β promoter contains putative NF-κB and AP-1 binding sites, and regulation of gene expression of other proinflammatory cytokines by estradiol has been shown to be mediated through modulation of transcription factor binding activity to these sites (57, 58). To limit microbial pathogenesis, mammalian host cells use pattern recognition receptors such as TLRs, which effectively recognize conserved bacterial molecules including LPS (reviewed in Ref. 59). Macrophages mediate this function in the uterine endometrium, because unlike epithelial cells, they are extremely sensitive to low levels of endotoxin. We have shown that stimulation of peripheral blood monocytes and uterine macrophages with LPS results in copious IL-1β production. In addition, high doses of estradiol further enhance LPS-induced IL-1β production in an ER-dependent manner. Significantly, both peripheral blood monocyte- and uterine macrophage-derived IL-1β induce the expression of antimicrobial HBD2 in human uterine epithelial cells. These data suggest a mechanism for the ability of the uterine endometrium to mobilize innate immune response to pathogenic challenge; this occurs through dynamic interaction between uterine macrophage and epithelial cells. Macrophage-derived proinflammatory IL-1β induces epithelial HBD2 production, and both potentially curb bacterial pathogenesis and inflammation. Collectively, these data implicate a role for estrogen in the modulation of the immune response and may lead to an enhanced understanding of inflammatory control mechanisms within the human FRT. We thank Kathleen Wardwell for her technical assistance and critical review of this manuscript. ↵1 This work was supported by National Institutes of Health Grant AI51877. ↵3 Abbreviations used in this paper: ICE, IL-1β-converting enzyme; FRT, human female reproductive tract; HBD2, human β-defensin 2; Pam3Cys, S-[2,3-Bis(palmitoyloxy)-(2-RS)-propyl]-N-palmitoyl-(R)-Cys-(S)-Ser-Lys4-OH, trihydrochloride; PGN, peptidoglycan; ER, estrogen receptor. McIntire, R. H., J. S. Hunt. 2005. Antigen presenting cells and HLA-G: a review. Placenta 26: (Suppl. A):S104-S109. Koide, S., R. M. Steinman. 1987. Induction of murine interleukin 1: stimuli and responsive primary cells. Proc. Natl. Acad. Sci. USA 84: 3802-3806. Higgins, G. C., J. L. Foster, A. E. Postlethwaite. 1994. Interleukin 1β propeptide is detected intracellularly and extracellularly when human monocytes are stimulated with LPS in vitro. J. Exp. Med. 180: 607-614. McAlindon, M. E., C. J. Hawkey, Y. R. Mahida. 1998. Expression of interleukin 1β and interleukin 1β converting enzyme by intestinal macrophages in health and inflammatory bowel disease. Gut 42: 214-219. Janson, R. W., F. G. Joslin, W. P. Arend. 1990. The effects of differentiating agents on IL-1β production in cultured human monocytes. J. Immunol. 145: 2161-2166. Wewers, M. D., D. J. Herzyk. 1989. Alveolar macrophages differ from blood monocytes in human IL-1β release: quantitation by enzyme-linked immunoassay. J. Immunol. 143: 1635-1641. Schumann, R. R., C. Belka, D. Reuter, N. Lamping, C. J. Kirschning, J. R. Weber, D. Pfeil. 1998. Lipopolysaccharide activates caspase-1 (interleukin-1-converting enzyme) in cultured monocytic and endothelial cells. Blood 91: 577-584. Thornberry, N. A., H. G. Bull, J. R. Calaycay, K. T. Chapman, A. D. Howard, M. J. Kostura, D. K. Miller, S. M. Molineaux, J. R. Weidner, J. Aunins, et al 1992. A novel heterodimeric cysteine protease is required for interleukin-1β processing in monocytes. Nature 356: 768-774. Kostura, M. J., M. J. Tocci, G. Limjuco, J. Chin, P. Cameron, A. G. Hillman, N. A. Chartrain, J. A. Schmidt. 1989. Identification of a monocyte specific pre-interleukin 1β convertase activity. Proc. Natl. Acad. Sci. USA 86: 5227-5231. Ferrari, D., P. Chiozzi, S. Falzoni, M. Dal Susino, L. Melchiorri, O. R. Baricordi, F. Di Virgilio. 1997. Extracellular ATP triggers IL-1β release by activating the purinergic P2Z receptor of human macrophages. J. Immunol. 159: 1451-1458. Simon, C., A. Mercader, M. J. Gimeno, A. Pellicer. 1997. The interleukin-1 system and human implantation. Am. J. Reprod. Immunol. 37: 64-72. Simon, C., A. Frances, G. N. Piquette, I. el Danasouri, G. Zurawski, W. Dang, M. L. Polan. 1994. Embryonic implantation in mice is blocked by interleukin-1 receptor antagonist. Endocrinology 134: 521-528. Simon, C., D. Valbuena, J. Krussel, A. Bernal, C. R. Murphy, T. Shaw, A. Pellicer, M. L. Polan. 1998. Interleukin-1 receptor antagonist prevents embryonic implantation by a direct effect on the endometrial epithelium. Fertil. Steril. 70: 896-906. Simon, C., G. N. Piquette, A. Frances, M. L. Polan. 1993. Localization of interleukin-1 type I receptor and interleukin-1β in human endometrium throughout the menstrual cycle. J. Clin. Endocrinol. Metab. 77: 549-555. Yeaman, G. R., P. M. Guyre, M. W. Fanger, J. E. Collins, H. D. White, W. Rathbun, K. A. Orndorff, J. Gonzalez, J. E. Stern, C. R. Wira. 1997. Unique CD8+ T cell-rich lymphoid aggregates in human uterine endometrium. J. Leukocyte Biol. 61: 427-435. Yeaman, G. R., J. E. Collins, M. W. Fanger, C. R. Wira, P. M. Lydyard. 2001. CD8+ T cells in human uterine endometrial lymphoid aggregates: evidence for accumulation of cells by trafficking. Immunology 102: 434-440. Dinarello, C. A., J. G. Cannon, J. W. Mier, H. A. Bernheim, G. LoPreste, D. L. Lynn, R. N. Love, A. C. Webb, P. E. Auron, R. C. Reuben, et al 1986. Multiple biological activities of human recombinant interleukin 1. J. Clin. Invest. 77: 1734-1739. Stylianou, E., L. A. O’Neill, L. Rawlinson, M. R. Edbrooke, P. Woo, J. Saklatvala. 1992. Interleukin 1 induces NF-κB through its type I but not its type II receptor in lymphocytes. J. Biol. Chem. 267: 15836-15841. Sims, J. E., M. A. Gayle, J. L. Slack, M. R. Alderson, T. A. Bird, J. G. Giri, F. Colotta, F. Re, A. Mantovani, K. Shanebeck, et al 1993. Interleukin 1 signaling occurs exclusively via the type I receptor. Proc. Natl. Acad. Sci. USA 90: 6155-6159. McMahan, C. J., J. L. Slack, B. Mosley, D. Cosman, S. D. Lupton, L. L. Brunton, C. E. Grubin, J. M. Wignall, N. A. Jenkins, C. I. Brannan, et al 1991. A novel IL-1 receptor, cloned from B cells by mammalian expression, is expressed in many cell types. EMBO J. 10: 2821-2832. Cartwright, J. E., G. Balarajah. 2005. Trophoblast interactions with endothelial cells are increased by interleukin-1β and tumour necrosis factor α and involve vascular cell adhesion molecule-1 and α4β1. Exp. Cell Res. 304: 328-336. Hoffmann, E., O. Dittrich-Breiholz, H. Holtmann, M. Kracht. 2002. Multiple control of interleukin-8 gene expression. J. Leukocyte Biol. 72: 847-855. Chaudhary, L. R., L. V. Avioli. 1996. Regulation of interleukin-8 gene expression by interleukin-1β, osteotropic hormones, and protein kinase inhibitors in normal human bone marrow stromal cells. J. Biol. Chem. 271: 16591-16596. Lisby, S., C. Hauser. 2002. Transcriptional regulation of tumor necrosis factor-α in keratinocytes mediated by interleukin-1β and tumor necrosis factor-α. Exp. Dermatol. 11: 592-598. Schaefer, T. M., J. A. Wright, P. A. Pioli, C. R. Wira. 2005. IL-1β-mediated proinflammatory responses are inhibited by estradiol via down-regulation of IL-1 receptor type I in uterine epithelial cells. J. Immunol. 175: 6509-6516. Selsted, M. E., A. J. Ouellette. 2005. Mammalian defensins in the antimicrobial immune response. Nat. Immunol. 6: 551-557. Yang, D., O. Chertov, S. N. Bykovskaia, Q. Chen, M. J. Buffo, J. Shogan, M. Anderson, J. M. Schroder, J. M. Wang, O. M. Howard, J. J. Oppenheim. 1999. β-Defensins: linking innate and adaptive immunity through dendritic and T cell CCR6. Science 286: 525-528. Schaefer, T. M., J. V. Fahey, J. A. Wright, C. R. Wira. 2005. Innate immunity in the human female reproductive tract: antiviral response of uterine epithelial cells to the TLR3 agonist poly(I:C). J. Immunol. 174: 992-1002. Dinarello, C. A.. 1988. Interleukin-1. Ann. NY Acad. Sci. 546: 122-132. Mentzer, S. J., P. M. Guyre, S. J. Burakoff, D. V. Faller. 1986. Spontaneous aggregation as a mechanism for human monocyte purification. Cell. Immunol. 101: 312-319. White, H. D., R. H. Prabhala, S. L. Humphrey, K. M. Crassi, J. M. Richardson, C. R. Wira. 2000. A method for the dispersal and characterization of leukocytes from the human female reproductive tract. Am. J. Reprod. Immunol. 44: 96-103. Tsutsumi-Ishii, Y., I. Nagaoka. 2003. Modulation of human β-defensin-2 transcription in pulmonary epithelial cells by lipopolysaccharide-stimulated mononuclear phagocytes via proinflammatory cytokine production. J. Immunol. 170: 4226-4236. Liu, L., A. A. Roberts, T. Ganz. 2003. By IL-1 signaling, monocyte-derived cells dramatically enhance the epidermal antimicrobial response to lipopolysaccharide. J. Immunol. 170: 575-580. Jones, B. W., T. K. Means, K. A. Heldwein, M. A. Keen, P. J. Hill, J. T. Belisle, M. J. Fenton. 2001. Different Toll-like receptor agonists induce distinct macrophage responses. J. Leukocyte Biol. 69: 1036-1044. Vora, P., A. Youdim, L. S. Thomas, M. Fukata, S. Y. Tesfay, K. Lukasek, K. S. Michelsen, A. Wada, T. Hirayama, M. Arditi, M. T. Abreu. 2004. β-Defensin-2 expression is regulated by TLR signaling in intestinal epithelial cells. J. Immunol. 173: 5398-5405. Pivarcsi, A., I. Nagy, A. Koreck, K. Kis, A. Kenderessy-Szabo, M. Szell, A. Dobozy, L. Kemeny. 2005. Microbial compounds induce the expression of pro-inflammatory cytokines, chemokines and human β-defensin-2 in vaginal epithelial cells. Microbes Infect. 7: 1117-1127. Hertz, C. J., Q. Wu, E. M. Porter, Y. J. Zhang, K. H. Weismuller, P. J. Godowski, T. Ganz, S. H. Randell, R. L. Modlin. 2003. Activation of Toll-like receptor 2 on human tracheobronchial epithelial cells induces the antimicrobial peptide human β defensin-2. J. Immunol. 171: 6820-6826. Valore, E. V., C. H. Park, A. J. Quayle, K. R. Wiles, P. B. McCray, Jr, T. Ganz. 1998. Human β-defensin-1: an antimicrobial peptide of urogenital tissues. J. Clin. Invest. 101: 1633-1642. Quayle, A. J., E. M. Porter, A. A. Nussbaum, Y. M. Wang, C. Brabec, K. P. Yip, S. C. Mok. 1998. Gene expression, immunolocalization, and secretion of human defensin-5 in human female reproductive tract. Am. J. Pathol. 152: 1247-1258. King, A. E., D. C. Fleming, H. O. Critchley, R. W. Kelly. 2003. Differential expression of the natural antimicrobials, β-defensins 3 and 4, in human endometrium. J. Reprod. Immunol. 59: 1-16. Soucy, G., G. Boivin, F. Labrie, S. Rivest. 2005. Estradiol is required for a proper immune response to bacterial and viral pathogens in the female brain. J. Immunol. 174: 6391-6398. Weitzmann, M. N., R. Pacifici. 2005. The role of T lymphocytes in bone metabolism. Immunol. Rev. 208: 154-168. DeLoia, J. A., A. M. Stewart-Akers, J. Brekosky, C. J. Kubik. 2002. Effects of exogenous estrogen on uterine leukocyte recruitment. Fertil. Steril. 77: 548-554. Suenaga, R., M. J. Evans, K. Mitamura, V. Rider, N. I. Abdou. 1998. Peripheral blood T cells and monocytes and B cell lines derived from patients with lupus express estrogen receptor transcripts similar to those of normal cells. J. Rheumatol. 25: 1305-1312. Romero, R., M. Sirtori, E. Oyarzun, C. Avila, M. Mazor, R. Callahan, V. Sabo, A. P. Athanassiadis, J. C. Hobbins. 1989. Infection and labor. V. Prevalence, microbiology, and clinical significance of intraamniotic infection in women with preterm labor and intact membranes. Am. J. Obstet. Gynecol. 161: 817-824. Cates, W., Jr, J. N. Wasserheit. 1991. Genital chlamydial infections: epidemiology and reproductive sequelae. Am. J. Obstet. Gynecol. 164: 1771-1781. King, A. E., D. C. Fleming, H. O. Critchley, R. W. Kelly. 2002. Regulation of natural antibiotic expression by inflammatory mediators and mimics of infection in human endometrial epithelial cells. Mol. Hum. Reprod. 8: 341-349. Dinarello, C. A.. 1997. Interleukin-1. Cytokine Growth Factor Rev. 8: 253-265. Witsell, A. L., L. B. Schook. 1991. Macrophage heterogeneity occurs through a developmental mechanism. Proc. Natl. Acad. Sci. USA 88: 1963-1967. Unanue, E. R., P. M. Allen. 1987. The basis for the immunoregulatory role of macrophages and other accessory cells. Science 236: 551-557. Quayle, A. J.. 2002. The innate and early immune response to pathogen challenge in the female genital tract and the pivotal role of epithelial cells. J. Reprod. Immunol. 57: 61-79. Adeyemo, O., H. Jeyakumar. 1993. Plasma progesterone, estradiol-17β and testosterone in maternal and cord blood, and maternal human chorionic gonadotropin at parturition. Afr. J. Med. Med. Sci. 22: 55-60. Sarda, I. R., R. H. Gorwill. 1976. Hormonal studies in pregnancy. I. Total unconjugated estrogens in maternal peripheral vein, cord vein, and cord artery serum at delivery. Am. J. Obstet. Gynecol. 124: 234-238. Ruh, M. F., Y. Bi, R. D’Alonzo, C. J. Bellone. 1998. Effect of estrogens on IL-1β promoter activity. J. Steroid Biochem. Mol. Biol. 66: 203-210. Srivastava, S., M. N. Weitzmann, S. Cenci, F. P. Ross, S. Adler, R. Pacifici. 1999. Estrogen decreases TNF gene expression by blocking JNK activity and the resulting production of c-Jun and JunD. J. Clin. Invest. 104: 503-513. Stein, B., M. X. Yang. 1995. Repression of the interleukin-6 promoter by estrogen receptor is mediated by NF-κ B and C/EBP beta. Mol. Cell Biol. 15: 4971-4979. Qureshi, S. T., R. Medzhitov. 2003. Toll-like receptors and their role in experimental models of microbial infection. Genes Immun. 4: 87-94.